Despite living in the age of techno-wizardry wonders that promise to make our lives less stressful, more people than ever say they feel more rushed, not less, in their day-to-day lives. That time pressure is a common experience is evidenced by the fact that an increasing proportion of the population report feeling short of time. Since 1965, the US time–use researcher John Robinson has been asking adults, “Would you say you always feel rushed, even to do things you have to do, only sometimes feel rushed, or almost never feel rushed?” The proportion of Americans reporting that they always feel rushed rose from 25 percent in 1965 to 35 percent forty years later. Almost half now also say that they almost never have time on their hands. According to most evidence, people perceive leisure time as scarcer and more hectic. And this is also true cross–nationally, where there has been consistent historical growth of busy feelings through the last part of the twentieth century. Perhaps it is time to think again about the level of progress/development/industrialism that we need, about returning to a slower, more agrarian lifestyle. Some words from the Japanese agrarian Masanobu Fukuoka are worth considering. We do not agree with all of his religious views, but overall he is very close to the truth. which has led the world into its present predicament. operations to small farms attached only to life itself. attentive-ness to and care for the ordinary activities of daily life]. the greatest of worlds will be revealed. pastimes which brought richness to the farmer's daily life. Dialectics (the idea that a thing and its opposite are reconciled by some mediating agent: i.e., thesis -> antithesis -> synthesis) is at the heart of Western Christianity after the Great Schism of 1054 (whether Roman Catholic or Protestant, for both still hold to the same Filioque, Augustinian theology of the Holy Trinity, i.e., the Holy Ghost proceeds from the Father and the Son, not the Father alone, and that God exists as an absolutely simple essence, and not as unknowable essence and knowable energies), so it makes sense that it would be so in the West’s political life as well. God is the author and type of all created things; and all creatures, each in its order, imitates or copies the Divine Being, who is intrinsically Father, Son, and Holy Ghost, principle, medium, and end. The Son or Word is the medium, which unites the two extremes, whence God is living God . . . . In the Holy Trinity is the principle and prototype of all society . . . .
Now human society, when it copies the divine essence and nature either in the distinction of persons alone, or in the unity alone, is sophistical, and wants the principle of all life and reality. It sins against God, and must fail of its end (The American Republic, ISI Books, 2003, p. 252). Our American constitution is the only philosophical, or dialectic, constitution the world has ever known. All life is based on unity in diversity; on extremes, with a medium of reconciliation. . . . Our constitution, . . . by the division of the powers between the general and the state governments, each acting in its own sphere, is founded in truth and in reality, has in it the principle of life, and so long as it is preserved in its essential character, cannot die (quoted in Michael Novak, On Two Wings, Encounter Books, 2002, p. 195, note 30). What then is the cause of this strange contrast, and why are the most able citizens to be found in one assembly rather than in the other? Why is the former body remarkable for its vulgarity and its poverty of talent, whilst the latter seems to enjoy a monopoly of intelligence and of sound judgment? Both of these assemblies emanate from the people; both of them are chosen by universal suffrage; and no voice has hitherto been heard to assert in America that the Senate is hostile to the interests of the people. From what cause, then, does so startling a difference arise? The only reason which appears to me adequately to account for it is, that the House of Representatives is elected by the populace directly, and that the Senate is elected by elected bodies. The whole body of the citizens names the legislature of each State, and the Federal Constitution converts these legislatures into so many electoral bodies, which return the members of the Senate. The senators are elected by an indirect application of universal suffrage; for the legislatures which name them are not aristocratic or privileged bodies which exercise the electoral franchise in their own right; but they are chosen by the totality of the citizens; they are generally elected every year, and new members may constantly be chosen who will employ their electoral rights in conformity with the wishes of the public. But this transmission of the popular authority through an assembly of chosen men operates an important change in it, by refining its discretion and improving the forms which it adopts. Men who are chosen in this manner accurately represent the majority of the nation which governs them; but they represent the elevated thoughts which are current in the community, the propensities which prompt its nobler actions, rather than the petty passions which disturb or the vices which disgrace it. The time may be already anticipated at which the American Republics will be obliged to introduce the plan of election by an elected body more frequently into their system of representation, or they will incur no small risk of perishing miserably amongst the shoals of democracy. And here I have no scruple in confessing that I look upon this peculiar system of election as the only means of bringing the exercise of political power to the level of all classes of the people (Democracy in America, http://www.gutenberg.org/files/815/815-h/815-h.htm, opened 21 Feb. 2017). I saw in States' rights the only availing check upon the absolutism of the sovereign will, and secession filled me with hope, not as the destruction but as the redemption of Democracy. The institutions of your Republic [i.e., the Confederate Constitution] have not exercised on the old world the salutary and liberating influence which ought to have belonged to them, by reason of those defects and abuses of principle which the Confederate Constitution was expressly and wisely calculated to remedy. I believed that the example of that great Reform would have blessed all the races of mankind by establishing true freedom purged of the native dangers and disorders of Republics. Therefore I deemed that you were fighting the battles of our liberty, our progress, and our civilization; and I mourn for the stake which was lost at Richmond more deeply than I rejoice over that which was saved at Waterloo. But as we saw in the quote from Dr Farrell last time, this structure is really no structure at all: It collapses back into a simple essence eventually, into the will of the people (whether expressed through a dictator like Napoleon or a disordered anarchy). Even those parts of a people’s life that are long rooted in their history are dissolved when the attempt is made to base political life solely on the will of the people. What is needed are new metaphysical principles to give stability to the social order, those principles being the distinction within God between His unknowable essence and His intimately knowable energies (His attributes, His actions in the world by which He is known, the rays of divinity that shine forth from the essence that mankind and all creation participate in), and the right understanding of the Three Persons of the All-Holy Trinity. Since essence and energies were mentioned in the last post, we will focus more on the relations between the Persons today. So strong an influence is the definition of simplicity for Saint Augustine that he says, “to God it is not one thing to be, another to be a person, but it is absolutely the same thing . . . It is the same thing to Him to be as to be a person.”44 “God” for Saint Augustine, thus, “did not mean directly” the means to attempt to distinguish the persons from each other. Having assumed an absolute simplicity, the persons can no longer be absolute hypostases, but are merely relative terms to each other, thus occurring on an even lower plane than the attributes proper. “The terms (Father, Son and Holy Spirit) are used reciprocally and in relation to each other.”51 There is a subtle but, nevertheless, real play of the dialectic of oppositions here. One no longer begins with the three persons and then moves to consider their relations, but begins with their relative quality, the relation between the persons, itself. In other words, there is an artificial opposition of one person to the other two. It is at this point that the flexibility of Augustine’s Neoplatonic commitment begins to surface in a more acute form. In God it is not possible for an “I” to assert himself over against another “I”; instead he continually considers the other as a substitute for himself. . . . Each person discloses not his own “I,” but two together reveal the other; not does each pair of persons disclose their own “I’s” in an exclusive way, but they place the other “I” in the forefront, making themselves transparent for that one or hiding themselves (as it were) beneath him. Thus in each hypostasis the other two are also visible. . . .
Life lived in a communion of love, emptying one’s self so that the other may abide in him, is the only foundation for personhood and existence, and the Holy Trinity as known in the Orthodox Church is the supreme ensample of both of these. An impersonal divine essence, and the system of dialectics that arises from it, cannot manifest love or communion, and so they cannot be the source of reality, but only of darkness and confusion whenever and wherever these ideas creep into the life of a people, as we are seeing in the West. Love in the world presupposes as its origin and purpose the eternal perfect love between a number of divine persons. This love does not produce the divine persons, as Catholic theology affirms, but presupposes them. Otherwise it would be possible to conceive of an impersonal love that produced and dissolved human beings. . . . Love, however, presupposes a common being in three persons, as Christian teaching tells us. In Orthodox countries, East or West (for the West was once Orthodox, before the Great Schism), and particularly where the natural hierarchical order of monarchy has existed, one sees the reflection of this Trinitarian life in their politics. The impersonal will of the people and its resultant Newtonian physics of government was not the ruling principle, but rather the transparency of the Persons of the Trinity. In its essential features, a basic threeness in the Orthodox governmental structure still remains, and is manifested as Church, king, and people (following Father Andrew Phillips’s lead). And whenever one looks at one of these, he sees the other two; or at two, he sees the other one. They are servants one of another; thus they do not relate to one another like objects in opposition to one another but like the Persons of the Trinity. In this self-forgetting of each person for the other perfect love is manifested and only this makes possible that unity which is opposed to individualism. The sin of individualism hinders us from understanding that fullness of love and unity which is characteristic of the holy Trinity and is at the same time compatible with the preservation of personal identity. The king is consecrated by the bishop of the Church, and owes the blessings of his reign to the continual prayers of his Christian subjects: monks, nuns, clergy, laymen. The Church is protected by the king and makes the presence of the Kingdom of God, of Paradise, a reality in the nation by the support and sanctification of the clergy and people. The people are united to their king and their bishop through the anointing of the latter two with the holy chrism, who thenceforward act as the fathers and shepherds of the people, without which there would be disorder in the land.
. . . In republics, all are represented. The representatives, or orderers, represent and are responsible to their constituents, the sovereign people. But these are not constituents only; they likewise represent the class of subsovereign people [those who did not meet the qualifications to be representatives or voters: ‘women, minors, criminals, lunatics and idiots, aliens, and all others disqualified or unqualified’--W.G. ]; these are the constituents of those. A man represents his family. This is special; he also represents the interests of other subsovereigns; this, his general duty. The representation of all is thus actualized. So we see that when someone looked at a man in the Old South, he did not see a single, opaque, isolated person (as in the ‘one person, one vote’ egalitarian ideology that was taking hold in New England at that time and which is now so common today), but, through that one person, he saw a host of others whom that one had taken into his bosom to care for. Returning for a moment to essence and energies before closing, we must note that whenever some disorder breaks out in after-Schism Western countries, the cure most of the time is something outward: a treaty, a constitutional amendment, and so forth. Everything is a rigid outer order of estates, who are playing a zero-sum game for worldly power, showing again that they are bereft of the idea of God’s outgoing energies (i.e., His Grace), of His nearness in the world, and how this can influence things. Because man cannot know God’s essence, when God is thought to be only an unknowable essence Whom we can only know from a distance by analogies, nothing is left to man for his consolation but the creation. The work of all the people of a þeod (nation) as individuals and as a whole to acquire the Grace of God, to be united with the knowable radiance of God (which is God Himself), no longer makes any sense. Self-denial becomes pointless, religion becomes a private affair - a matter of personal preference, and the satisfaction of man’s various desires for money, power, etc. become the chief end of life. This is why politics has become so important in Western life after the Great Schism rather than religion (and why it has in many cases become a substitute for religion). In Orthodox countries on the other hand, though they are far from neglecting the normal workings of government: laws, courts, etc. (one only has to consider rulers like Alfred the Great of England or Justinian the Great of Constantinople/New Rome) - nevertheless, how often do we see as well troubles ended and reconciliation brought about by God’s Grace, and not some rationally contrived, man-made mechanism or device? The appearance of a holy icon (the Kazan Icon of the Mother of God during the Time of Troubles in Russia), the blessing of a holy elder (St Sergius of Radonezh blessing Dmitry Donskoy before his battle with the Mongols), or holy relics (the protection of Paris by the relics of St Genevieve; the arrival in Serbia of St Sava with the relics of his father St Symeon, which ended the feud between St Sava’s brothers for political power), and so on. The West will now only accept a rational, scientific solution in politics (though once this was not the case, and can be again if she will only bend her proud neck), but the Orthodox world understands that mystery and antinomy are very much a part of life. For God and his relations with the world transcend all the concepts reason alone gives us about these things. There must be room in political life for the inbreaking of God’s Grace. 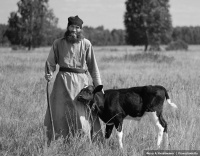 In the tradition of the Eastern Church [i.e., the Orthodox Church--W.G.] there is no place for a theology, and even less for a mysticism, of the divine essence. The goal of Orthodox spirituality, the blessedness of the Kingdom of Heaven, is not the vision of the essence, but, above all, a participation in the divine life of the Holy Trinity . . . . The Holy Trinity is, for the Orthodox Church, the unshakeable foundation of all religious thought, of all piety, of all spiritual life, of all experience. It is the Trinity that we seek in seeking after God, when we search for the fullness of being, for the end and meaning of existence. . . . If we reject the Trinity as the sole ground of all reality and of all thought, we are committed to a road that leads nowhere; we end in an aporia, in folly, in the disintegration of our being, in spiritual death. Between the Trinity and hell there lies no other choice. . . .
As the late George Carey and I were writing our recently published Constitutional Morality and the Rise of Quasi-Law, we were convinced that we would be criticized for not providing “solutions” to America’s constitutional crisis. Still, we refused to engage in the drawing up of utopian blueprints. Given the nature of our diagnosis, we were convinced that ready-made solutions would not avail in these times. That diagnosis, in brief, is that our political class has become too corrupt to understand, let alone value and defend, the constitutional structures essential to free government within our political tradition. Not unexpectedly, reviewers have, in fact, criticized the book for lacking mechanistic solutions to moral problems. Recent events show, however, that even the most obvious of such solutions have no chance of success until and unless a far more difficult reform is achieved within the minds and characters of those who sit in what was designed to be our sole federal lawmaking body—the Congress. Until Members of Congress rediscover the most basic virtue necessary to fulfill their role in our constitutional government—until they insist on exercising the power and taking the responsibility for passing all federal laws—no amount of tinkering can hope to restore our republic. So why have the functions of the three branches of the federal government become so disordered (and this is applicable to the idea of the division of powers at all levels of government in the States)? Because of those very ‘constitutional structures’ Mr Frohnen and others consider ‘essential to free government within [the u. S.] political tradition’, or, better said, because of the principles that lay behind them. At the foundation is the false idea of absolute divine simplicity (that God is only essence and not essence and energies) as taught by Plotinus and accepted by St Augustine (whose speculative teachings broke with the consensus of the experiential theology of the other Holy Fathers of the Orthodox Church); from St Augustine’s writings it spread throughout all the West through the Roman Catholics and Protestants, who took him as their main theological teacher. John Locke’s idea (repeated by Jefferson in the Declaration of Independence and by many others) that all government derives from the will of the people is a secular expression of absolute divine simplicity within the realm of politics: Just as the three Persons of the Holy Trinity arise from the Divine Essence, so too the three branches of the federal government arise from the will of the people. In fact, the teaching of St. Gregory affects the whole system of theology, the whole body of Christian doctrine. It starts with the clear distinction between "nature" and "will" of God. This distinction was also characteristic of the Eastern tradition, at least since St. Athanasius. It may be asked at this point: Is this distinction compatible with the "simplicity" of God? Should we not rather regard all these distinctions as merely logical conjectures, necessary for us, but ultimately without any ontological significance? As a matter of fact, St. Gregory Palamas was attacked by his opponents precisely from that point of view. God's Being is simple, and in Him even all attributes coincide. Already St. Augustine diverged at this point from the Eastern tradition. Under Augustinian presuppositions the teaching of St. Gregory is unacceptable and absurd. St. Gregory himself anticipated the width of implications of his basic distinction. If one does not accept it, he argued, then it would be impossible to discern clearly between the "generation" of the Son and "creation" of the world, both being the acts of essence, and this would lead to utter confusion in the Trinitarian doctrine. St. Gregory was quite formal at that point. It is at this precise point that the uncanny logical accuracy of Photios posed acute difficulty for the later Western theology. The force of the previous argument was too much to ignore and some response had to be made. The one who made it was Thomas Aquinas, writing four hundred years after Photios. “Of course,” he says, “[the procession] does not proceed further within itself, but the cycle is concluded when . . . it returns to the very substance from which the proceeding began.”100 But this argument would only serve to make the procession a feature of the divine essence, and not of the person of the Holy Spirit. Saint Photios is ready with a response to this aspect before Thomas ever wrote: If the dual procession were a characteristic of the divine essence and not a personal property, then all productions from the Father were features of the essence, and thus the personal procession or the Spirit from the Son, and even from the Father, was artificial and superfluous. “If He [the Spirit] is known more fully in another procession which is proper to the essence,” asks Photios, “then what precise thing does that fashioning by another person provide?”101 In other words, if one accepts the concept of personal processions which are somehow also essential, then there can be no Trinity, and the filioque will indeed be, as Father Richardson pointed out, a matter of words! so too does the absolutely simple essence of the will of the people make the distinctions between the three branches of the federal government illusory. Thus, legislature = executive = judiciary, and the lamenting over the failure of the constitutional structure is thoroughly pointless. It was doomed to failure from the start because of its metaphysical foundation. We will try to have a bit more to say about this soon. And the kinsfolks’ craft to earn his bread. And a closet of consumer goods? St Valentine’s Day in the after-Schism, after-Reformation West has met the same fate as other holy days on the Orthodox Church’s calendar: It has been emptied of anything truly holy (prayers, Church services, processions, icons, etc.) and turned into an excuse for debauchery by the masses and for money-making by the merchants.
. . . the Encyclopedia Britannica says: "St Valentine's day as a lovers' festival... has no relation to the saint or to any incident in his life. These customs seem rather to be connected either with the pagan Roman festival of the Lupercalia which took place in the middle of February, or with the spring season in general." But for those seeking a patroness of courtship, marriage, and so forth, such a one does exist: St Dwynwen of Wales. 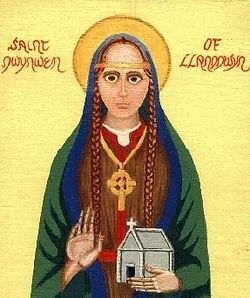 One of the most celebrated female saints of Wales is Venerable Dwynwen (also Donwenna: + c. 460; according to another version: fifth-sixth centuries). The name “Dwynwen” means “she who leads a blessed life”. She hailed from Wales and was famous for her ascetic life. . . . pious people in Wales and Cornwall greatly venerated and loved this saint throughout the centuries.
. . . this saint led an ascetic life in Llanddwyn for many years and became the patron of love and marriage afterwards for very many centuries. Thousands of pilgrims from Wales and even beyond flocked to her chapel, the shrine with her relics and the holy wells associated with her at Llanddwyn every year, in spite of the extreme remoteness of that site, and asked for her protection – and numerous miracles were recorded. The shrine of St. Dwynwen was so famous that it rivalled St. David’s Cathedral with the shrine of St. David and the holy well of St. Winifred at Holywell in popularity in Wales. Especially young men and girls from Wales and other parts of Britain used to come to St. Dwynwen at Llanddwyn, fervently pray, asking for her protection and granting a blessed and successful marriage through her intercessions – and many received that what they asked for. In the Middle Ages the chapel (and later church) in Llanddwyn was enlarged and many times received generous donations as an expression of believers’ gratitude for its patron-saint’s prayers. The medieval church must have been very splendid, and it certainly had a golden statue of its patroness. Wax candles were permanently lit around the saint’s shrine and the local parish gradually became one of the richest ones in North Wales. The prominent Welsh poets Dafydd ap Gwilym (mid-fourteenth century) and Dafydd Trefor (in c. 1500) both visited Llanddwyn and praised its beauty and spirituality, along with the virtues of St. Dwynwen, in verses of their poems. A number of very touching songs were dedicated to the saint over the centuries. The petitions of many pilgrims who were in love or asked for a lifelong husband or a wife were fulfilled after their prayers near St. Dwynwen’s relics as well as by her holy well. . . . Despite the great distance, proximity to the forest and prohibition of the veneration of saints after the Reformation, the influx of pilgrims continued even for some time after Henry VIII. St. Dwynwen, however, helped not only lovers, but also the sick and even animals. Many farmers of Wales considered her their and their animals’ heavenly patron. Countless cases of healing from various ailments near her relics and holy wells were recorded (cures from different aches, pleurisy, warts); miracles continue to occur even nowadays. . . . The revival of the veneration of St. Dwynwen began in the nineteenth century, when a fourteen-foot-tall cross was erected in her memory close to the church’s ruins (the supposed site of her hermitage), and in 1903 a Celtic-style St. Dwynwen’s cross was installed nearby. . . .
. . . There is also a revival of Dwynwen’s veneration as a protectress of farm animals. We hope and pray that the veneration of this ancient Orthodox saint, patroness of love and marriage, will increase among Orthodox Christians as well. Holy Mother Dwynwen of Llandwyn Island, pray to God for us! May the South also join in that renewed veneration! Industrialism: Losing More Than We Have Gained?